An epic number of beards took the stage as the backing band for Father John Misty. Ever the ostentatious performer, man-of-the-moment Joshua Tillman grabbed the mic stand, flipping it upside down and trailing it across the stage while the first notes of "I Love You, Honeybear," broke out. Perching atop the bass drum, his sequined shoes catching the blazing sun, Tillman worked his charm, gyrating and intimately grabbing the mic stand at every opportunity. To shouts of "I love you!" he cheekily replied, "I love you, too. I just need more time." His banter with the crowd was spot on, riffing on the big industries for buying up the surrounding land for development. 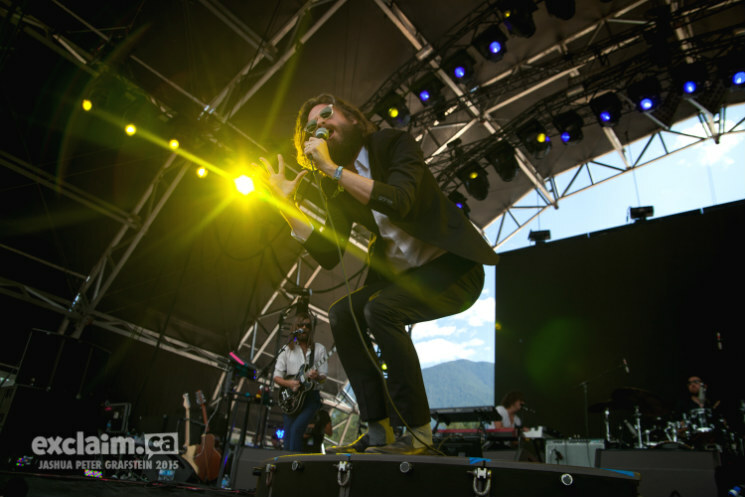 Antics aside — like the sensual gyrating, knee-drops every five seconds, or playful exchanges joking about playing the steel drums and rounding out the set with spoken word — Father John Misty's set was a sight to behold, their musical prowess on par with their engaging performance. Blowing through "True Affection," their energy and control was absolutely palpable. Fan or not, their performance was something to marvel at.